The Crypto space is making headlines in Norway again. This time the discussion isn't focusing on the value. Data centres have a lower electricity tax, which attracts large companies. But now Norway has decided that data centres that also mine crypto currencies will no longer be eligble to the lower tax. Which are causing the companies to cancel planned centres. Among the companies are Bitmain. Electricity tax levels for data centres in Scandinavia. The new regulation will have the data centres that mine cryptos paying 16,58 øre/kWh from 1 January 2019, in Norway. The Norwegian government expects to earn 10 million NOK from the increased tax level (roughly £1 million). Cryptovaults have several centres already in Norway. Canadian Hive Blockchain is planning to build a huge data centre in the northern Norway. According to e24.no, new data centres may use as much electricity as half of the country's power usage. For the last couple of years, the price for electricity was low on Nord Pool market. Around 30 öre/kWh I would say. This year the prices has been steadily climbing, and around 50 öre/kWh I would say. Plus taxes and other cost. Will the large crypto farms/centres scale-back be positive for the smaller communities, if the large farms are shutting down some operation? Or is this of no help to crypto miners like yourselves? When the bottom falls out of the market and you're waiting for things to get stable again and the bottom falls out again!!! Not quite sure what the cause of the latest crash is, but damn! I think one good thing that comes from a dramatic and sudden fall in profitability is that it flushes out inefficient operations and those who are purely in it for the money, which all helps to reduce centralisation. It leaves only those who are committed to the success of cryptocurrencies and those who care less about profit, such as smaller, home operations and those who mine efficiently or at no-cost (by making use of the heat, for example). And of course the best time to buy is when the price is low, which leads to new money pouring in and new investment from those who have been waiting for the right time to jump in. Meanwhile, most miners either stop mining or stop selling, reducing supply, setting the stage for a strong upward price movement once the whales have decided where the 'bottom' is. I like the concept of PoW (Proof of Work), aka mining, because it puts real, measurable value into the coins in the form of the energy required to produce them. After all, the fundamental value of all things is energy, so what better way is there to instil value than to provide a mathematically proven cost of production? Certainly the same thing can not be said of 'real' money, which costs very little to produce and is printed at will by governments, continuously diluting its value. However, I think PoS (Proof of Stake) is a great concept too, in which investors merely need to hold (or "hodl") new coins in their wallets to take part in the 'minting' process and thus earn their share of the rewards. I think ultimately, a hybrid mix of PoW and PoS are the way forward. For technical reasons (caused by a change in the reward structure and users being slow to update to the latest Linda wallets) the rewards were less than they should be first couple of months, but this month has been on target so far. 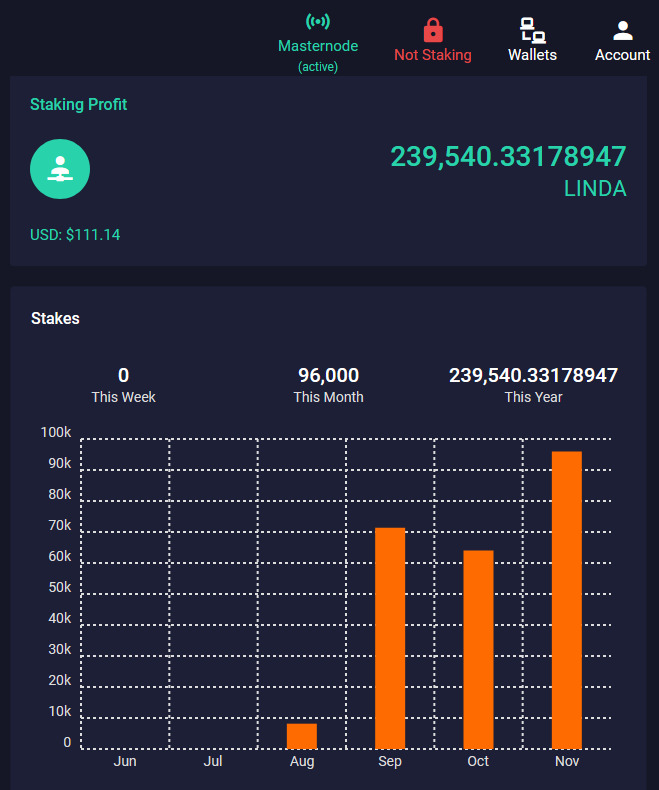 I've been staking Linda too (in the Qt-based wallet) and my stakes were doing slightly better than the masternode at first but this month the masternode has earned more than staking the same amount would. On average, staking should earn about 50% per annum while a masternode should earn about 60% per annum. I'm using MyStakingWallet to run the masternode, which costs about £8/month. And, for simple staking, I'm just running the official Linda Qt wallet on a server 24/7, which uses very little resources and no additional energy (since the server runs 24/7 anyway). and therefore costs nothing to run. Last edited by moltuae; 26th November 2018 at 02:38 PM. Dunno About you guys, but i've now got a load of bitmain coupons $340, $250, $160 & $65 - No idea quite what to do with them....They seem to expire the end of the month, but I've not turned any of my exsisting ones (2xS7, 1xS9) on in almost a year!!! I've been running most of my rigs over the winter months. Probably not made much more than they cost to run, but at the very least I've effectively had free heating. I've starting to turn some of them off now that the weather is warming up though. I've received loads of Bitmain coupons too. I'm not planning to purchase any more miners in the near future, especially as we're heading into the summer months now, so I'll probably just let them expire. Bitmain seem to send coupons out whenever there's a dip in sales so no doubt they'll issue more coupons in future. I had a look if I could use those coupons but only miner available to by was DR5, which I was not that interested in and they only allowed to use $65 coupons on it, not higher value vouchers. It's been quite time for crypto. I still run my GPUs and 1 L3+ in house 24/7 which means heating rarely comes on. AMD GPUs still do CN heavy and loosing money these days but I have been a bit lazy to switch them over. The rest of L3+s and S9's in garage switch on only during nights when I have free electricity using smart sockets or if they get rented at a much higher price. I do use purse.io quite a lot to buy stuff on Amazon. I do buy a lot on ebay or Aliexpress as well when it is cheaper there or sometimes if I want same day delivery I still buy direct on Amazon. But for example if I buy something using purse.io worth £40 I do not use my existing BTC but buy £40 worth of BTC on Wirex, spend about £30 worth of it on purse.io to buy it and have about £10 in BTC left over and accumulate it. If BTC price goes to 0 I have paid full price for goods, if it goes back to $20k, I havev had the stuff I bought for free. Also bought some stuff for friends, they get 10% discount, I keep 15%. Last edited by ainarssems; 6th April 2019 at 09:21 PM. I think it'd probably be wise to 'HODL' any BTC you have right now rather that use it to buy stuff. The price has almost certainly 'bottomed' following that looooong correction and I think we're on the verge of a new bull run that could reach record highs again within the next 12 months. I continue to follow the news and market closely and there seems to be a strong indication overall of growing adoption and upward pressure, which is only likely to be accelerated by the economic turmoil we're seeing in a growing number of countries. Mining wise, my rigs are still running as heaters, although I've started turning some of them off (mainly the noisier, less profitable L3s rather than the GPU rigs) now that the weather is getting warmer. Still HODLing though and I will be staking instead of mining through the warmer months. I think it'd probably be wise to 'HODL' any BTC you have right now rather that use it to buy stuff. I do not spend the BTC I have to buy stuff, instead I buy BTC to buy stuff. Say I want to buy stuff worth £100, I buy £100 worth of BTC on Wirex, then transfer to purse.io then buy the stuff I want with 32% discount, accounting for purse.io fees and spread on Wirex this means I have about £25 worth of BTC left over which I HODL. If BTC value goes to '0' , it will mean I have paid full price for the goods. If BTC goes to $20k and I sell my leftover BTC at that point it will mean I ge my money back and essentially have got the stuff for free. Last time I spent any crypto I own was about a year ago when I sold couple of LTC when they were $180 to cover electricity costs.